Have you ever walked around a cruise ship and wondered how such a gigantic vessel was designed and constructed? Cruise ships are basically mini floating cities that move from place to place. There are countless things to consider when planning such an undertaking, and we rounded up five things you may not have known about the how these behemoths are put together. 1. The ship is built in blocks. The Solution: Much like a large Lego structure or Tetris game, cruise ships are built of blocks that are pre-fabricated before they ever touch the ship. Cabins are the best example of this. Not only are these metal rooms assembled and covered in wallpaper before they are installed, but everything down to the furnishings and faucets are also in place before they slide into the side of the vessel. The process for building a cabin is a lot like the assembly line at an automotive manufacturer. Each person has a particular job to do, and they do the same one for each cabin as they move down the line; everything from large built-in furniture down to the screws in the shower door. Cabins aren’t the only thing built in sections, either. 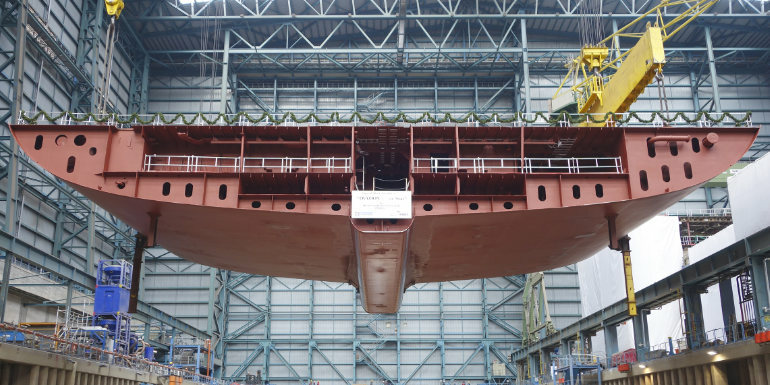 Most of the ship is constructed like that, including the steel plates that comprise the hull. Fun Fact: When Carnival Vista was being constructed, they had to cut through one of the cabins to get the IMAX screen onto the ship - in three pieces. 2. 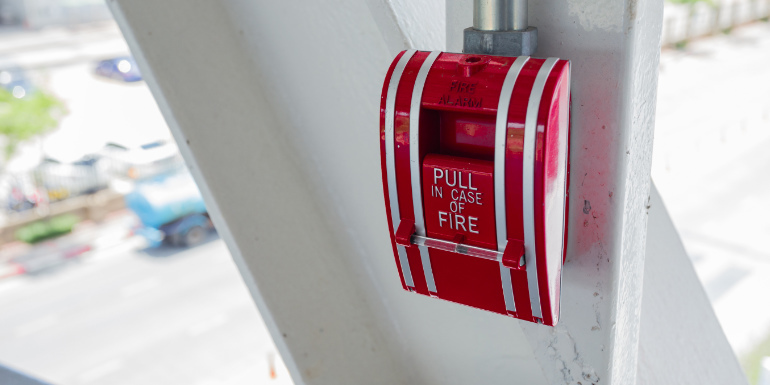 Fire is a cruise ship's biggest threat. The Problem: There's nowhere to run if a fire breaks out onboard. The Solution: As a safety measure, there are fire zones throughout the ship and each one is usually comprised of 10-20 blocks. The walls comprising the outside of each zone are more heavy-duty and made of fire-resistant materials, and if you’re looking it’s often easy to tell where a zone begins and ends because of the fire doors. The zones are designed into the ship so that in the unlikely event that there is a fire onboard, there’s a good chance it will be contained to just one zone and won’t alter the ability of the vessel to float or move, and guests will be safe in the other zones. 3. Vibration has to be accounted for. The Problem: You may not notice it in all areas of a ship, but no matter where you are there is always movement and vibration. On land, this wouldn’t be a concern when designing a building. At sea though, cruise vessels need to be built so that the steel structure is not compromised by constant movement. 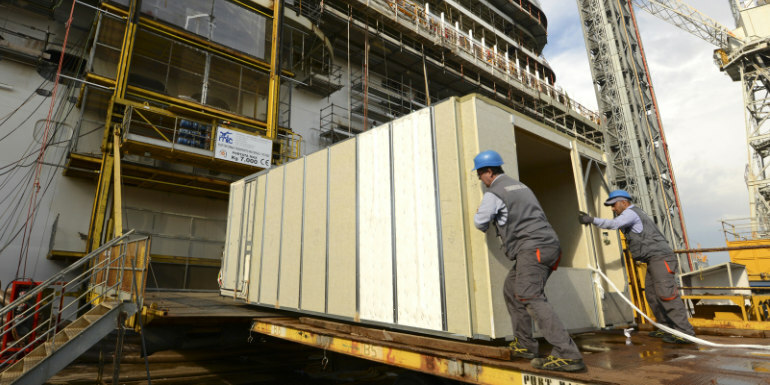 The Solution: To minimize the vibrating sound, insulation is a cruise ship’s best friend in addition to a more technical component of the structure called vibration isolation mounts. These are basically small shock absorbers that are used in key areas of the ship’s skeleton. A rather unique example of accounting for vibration is when hospitality designer Adam Tihany began working on Celebrity Solstice. 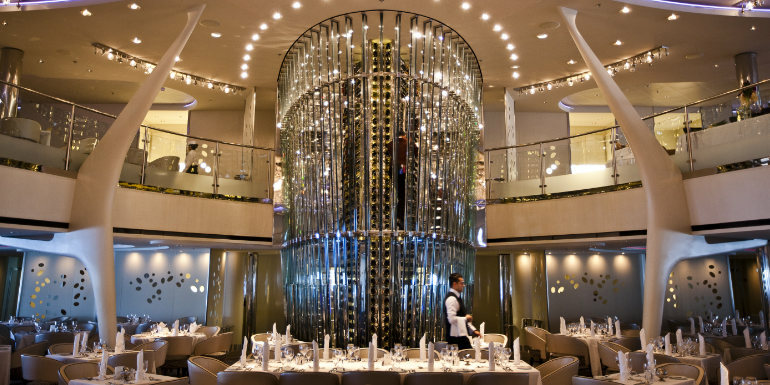 He proposed the idea that the ship have a wine tower; an idea that eventually came to fruition in the main dining room. When he shared his idea, everyone in the room gasped and reminded him that since the ship is always moving, the wine bottles would be too. In the end, a system was designed that suspended each bottle separately so that they would not fall out or knock into each other. 4. It's all a façade. The Problem: Openings for doors, stairs, elevators, plumbing, and more contribute to the weakening of the ship’s structure, as is the case for any “building.” Because of this, each deck and space is meticulously engineered for maximum strength while also bearing in mind a big concern for a floating vessel: weight. 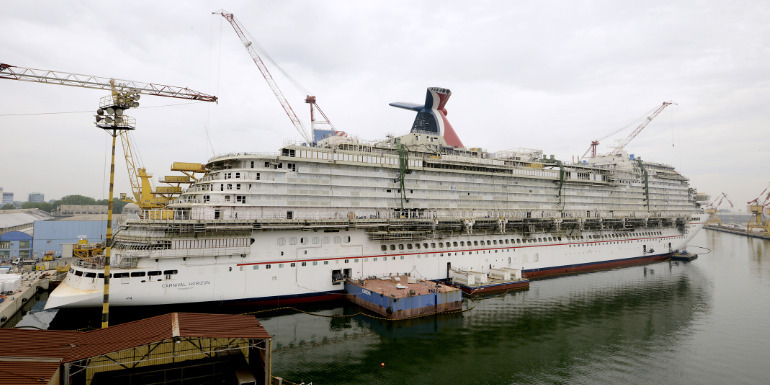 The Solution: To float, a cruise ship is designed to displace an amount of water that is equal to its own mass; in the case of a cruise ship, the open space inside. The pressure of the water pushes up, the vessel’s weight pushes down, and that equilibrium along with the meticulous shape of the ship’s hull allows it to stay afloat. This means that during the structural engineering phase all the way down to interior design, weight has to be taken into consideration. On the interior design side of things, one way this is done is by a bit of optical illusion. 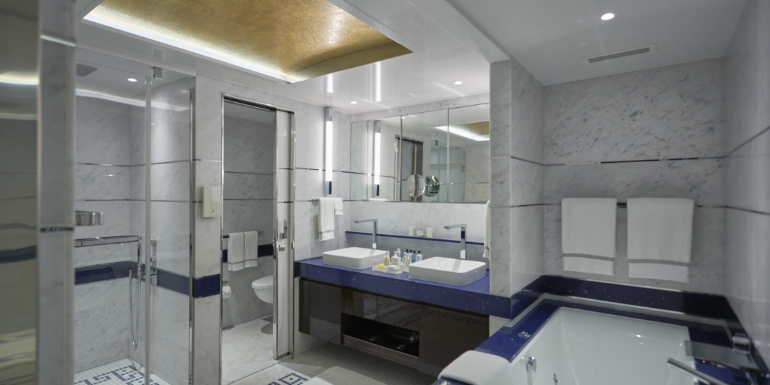 Consider the marble that may adorn the atrium, a restaurant, or a luxurious suite on the ship. Though it looks like it must have taken considerable manpower and money to acquire such a beautiful, heavy material, there’s less marble there than you think. It’s actually affixed to something, like a lightweight, honeycomb aluminum structure to minimize weight while still looking every bit as luxurious as a solid piece. Other things to consider are safety, not only in weight but also stability since the ship is always moving. Take the focal point of many atriums: the chandelier. To prevent the thousands of crystals from breaking loose and falling on someone, they are often reinforced with steel and attached to a metal frame. They are then cleverly lit so that you only see the pretty sparkle; not the heavy-duty elements behind them. 5. The bottom of the vessel is comprised of watertight compartments. The Problem: One major reason the Titanic sank so quickly was because the compartments in the bottom were just watertight horizontally, and the walls only went up a few feet above the waterline. If they had been just a few feet taller or joined with the deck above, it would have sunk much slower because the water would have been contained in just the damaged compartments much longer. The Solution: Cruise vessels in modern times are comprised of true watertight bulkheads for just that reason. Unlike the Titanic, they are watertight both horizontally as well as top to bottom. If a situation is dire enough, there’s also an option for the crew to pump water into compartments on the opposite side of the ship from where the damage has occurred, to keep it balanced and lessen the chance that it will tip over. Fun Fact: Have you ever noticed that your ship probably doesn’t have a deck 13? Historically sailors have always been superstitious, and many consider the number 13 to be unlucky. Even now, some of those superstitions have continued on in the modern maritime world. Which aspect of construction is the most interesting to you?